Four of us spent and incredible day with Didi. We had asked him to change the original tour a bit and he tailored it our our desires. Didi has so much information to share and so much energy. He was humorous and very easy to spend a full day with. We saw so many beautiful and interesting things. If you book your tour with Didi you will be very pleased. We cannot speak highly enough of Didi and the tour. We greatly appreciated his knowledge specific to Salzburg, and his great personality. We fell in love with the city, and that is mostly due to our time that we spent with Didi. We highly recommend Didi as he offers a First Class service. What an absolute pleasure it was for the four of us to be shown around Saltzburg by Didi. He was most informative, helpful and amusing and his tips and recommendations made the rest of our trip easy, memorable and great fun. Highly recommended! Dietmar provided an excellent and informative tour. He is very knowledgeable and accommodating. I would definitely use him again. Excellent tour guide who knows it all and who kept a family of five informed and entertained for over eight hours! We had a tour by Dietmar (Didi) Innsbruck OMG OMG OMG really the BEST!! We have traveled the world and I can say Didi is one of the BEST - He makes the day interesting and fun- we were a family of 6 and everyone was interested- He has an EXCELLENT personality and is a wealth of information!! He is one that loves what he does and therefore makes it very enjoyable for everyone! Thank you! Didi was an incredible guide. His fund of knowledge is extraordinary. On our drive from Passau to Salzberg he was a non-stop font of knowledge. I would recommend him highly to anyone wanting a private guide in Salzberg. We are absolutely stunned by the knowledge this guy has. Not a question he left unanswered. Very friendly and positive. Would highly recommend this to anyone visiting his area. With better planning it could be a better tour. The Octoberfest jam and a matchday at Bayern see us missing a few interesting places. Tq Didi for trying your best. Very punctual. had great information and most helpful. willing to go the extra miles. thanks a lot Didi and tourbylocals team. TOUR GUIDE RESPONSE: Dear Khairani Kassim and family! Thanks very much for the nice comment. Hope to sèe you again in Austria. Best regards! Didi N.
Didi was an amazing tour guide! We only spent one full day in Salzburg, but it was a day well spent as he showed us all around the city as well as driving us up into the mountains to see some of the beautiful lakes and towns that surround the city. He had SO much history to tell us about all of the sites we visited, as well as suggested some great restaurants and bars to try when we got back from the tour. Salzburg was one of my favorite stops on our euro trip, and it was all thanks to Didi! Didi is a very good guide and we are really pleased with his service and behaviour. We had a bad luck that we stuck on the mountain as cable car stopped working suddenly. And we were there all day and we didn't go anywhere else. But that day our guide Didi helped us a lot, and he didn't left us until we came down. Didi was superb! There are Sound of Music Tours and then there are Didi's tours! 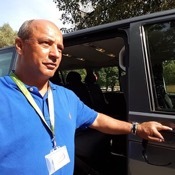 His extensive knowledge, his witty personality and his unrelenting desire to go out of his way to make the tours special make his tours truly UNFORGETTABLE! We had a blast! Thank you, Didi! Tours by Locals, I'm keeping your information handy for our next trip . . . your Guides have been incredible!! Utilizing ToursByLocals was without question the best decision we could have made for our recent trip. Our guide was Dietmar (Didi). He did a remarkable job putting together a custom tour itinerary that both accommodated our travel requirements and allowed us to see multiple points of interests in the comfort of a well-appointed van. We were a group of seven with luggage. Didi was absolutely the best guide we could have hoped for as first-time American tourists to the Bavarian region. just what we were looking for. Too bad the weather was not better! TOUR GUIDE RESPONSE: Dear Bill! Thanks for the request. Yes sometimes the weather does not play the way we want. But I am sure, that you have enjoyed the tour to Eagle's Nest and surroundings. Thanks and best regards to your whole family! Didi N.
Good tour - guide is knowledgeable. Good tour. Didi was awesome! So knowledgeable and perosnable. Definitely the way to go rather than a big public tour. Would definitely do again just to hangout with him and learn more! Didi has very extensive experience and the detail he knows is immense. He was great and we had a fantastic day with him. Friendly, on time, knowledgeable. A memorable trip with added background of someone with local knowledge. TOUR GUIDE RESPONSE: Dear Doreen! Thanks for rating! All the best to you! Greetings from Salzburg! Didi N.
Excelent tour, Didi was very fluent in spanish and english and he had also excelent knoledge of historical facts, very ilustrative tour. Didi was an amazing guide and we had such a great day with him. He is an encyclopedia of knowledge and gave us such great information during our day with him. Do not hesitate booking him! You have stumbled upon the best. Thanks Didi! TOUR GUIDE RESPONSE: Dear Kristi! Thanks for your comments. I wish you and your parents a Merry Christmas and a Happy New Year!! Didi was extremely knowledgeable and gave us a very thorough tour of the Salzburg region in addition to the Eagles Nest and Hitler's Berghof house location. He speaks 6 languages, and I was amazed at this grasp of the history of European affairs. I am a WWI and WWII history buff and Didi had it down pat. He was outstanding and I highly recommend him. Also, his vehicle was first class. Didi was a fabulous guide. He regaled us with interesting facts about the towns and regions we visted. His knowledge about history, current events, and physical surrounding is extensive. Customer service was wonderful. This guide is very flexible & knowledgeable about Salzburg & other parts of Austria, Germany, & Hungary.The tour to Eagle's Nest (Fall 2017) &the surrounding countryside (Including a palace, a replica of Versailles) was comprehensive and fascinating.The view of the Alps top of Eagle's Nest is a unique experience - a "must see". The guide knows the area well. One will have a better understanding of WWII & the part this area played during WWII and in the present. Vehicle - great! Highly recommend this tour. Didi was an excellent guide. Unfortunately, he didn't realize we'd purchased the Salzburg pass until later in our tour, so we were unable to take full advantage of the pass until late in the tour. It was still a great tour of Salzburg, and I would definitely recommend him for a day tour of the city. Didi was very knowledgeable about the history of the city and the various sites, and we saw so much more as a result than if we'd tried to see the sights on our own. Very thorough! Didi was very knowledgeable, flexible and tailored our tour to our requests as the day progressed. Nothing was too much trouble and he made some excellent suggestions when we asked him to "just show us about". Would recommend Didi as a guide. This was a long day, as we knew it would be given where we were going. Didi showed us the quarry and a nearby subcamp. Traffic was a bit of a bear on the return journey and we spent time trying to find a less congested way. The camp, though, is worth the hassle of the trip to get there and back. We found the memorials erected by various countries very moving, as we were again reminded of how horrible war is and of the terror that Hitler imposed. We were two couples traveling on a Viking Cruise. We met Didi right at our ship and spent the next 9 hours touring Austria. He is a prompt, knowledgeable, and personable guide and driver and we had a great time. We travelled to Salzburg on one route, spent an amazing time in Salzburg including a great lunch, and then he brought us back a different route through the lakes of Austria. Truly a wonderful experience all around and would highly recommend Didi to anyone travelling in this beautiful country. TOUR GUIDE RESPONSE: Dear Michele! Thanks very much for the nice comment. I hope to see you again in Salzburg! All the best to you and your family. Best regards! Didi N.
DIDI gets a 10!. What an awesome guide-a wealth of knowledge who went above and beyond, staying hours every day beyond our tour end times to make sure we saw everything we wanted. Got us quickly and first in line everywhere,every restaurant reservation we wanted,tour ,boat ride, and even booked a 5 star hotel at half price last minute when our booking fell thru. Gave us euros when our atm card didn't work. He knew the history of every town, historical person, every city, etc, - best 3 days of our trip! TOUR GUIDE RESPONSE: Dear Carol! Thanks very much for this comment. I hope you will enjoy the rest of your trip and hope to see you again in Europe or in the USA. All the best for the full family!!! Best regards Didi N.
TOUR GUIDE RESPONSE: Dear Magarete! Thanks for rating. All the best to you all!! Didi N.
We had Didi as our guide and had a wonderful day. He knows so much about Salzburg and the surrounding area. He had a great sense of humor and was a great guide. He showed us the Sound of Music highlights as well as Salzburg and the lakes. If u can book him you will have a great time! We had Tours By Locals for four days and all went well. Didi was really a pro at his job. We would definitly recommend them. Didi was a wonderful guide that gave us ample information on the history of the city, pulled in his own personal history to make it more meaningful, gave highlights of where to go on our own afterward, and gave us excellent restaurant recommendations. I would highly recommend him to anyone considering a tour of Salzburg. TOUR GUIDE RESPONSE: Dear Jennifer! Thanks for the nice comment. I wish you a Merry Christmas and a Happy New Year! Didi N.
Amazing day with Dietmar who is extremely knowledgeable and so eager to share. We loved his humour too. Dietmar was great! Tour was peppered with so many stories and lots of humour. We had a great time in Salzburg. TOUR GUIDE RESPONSE: Dear Irene! Thanks for rating! Have a nice trip for the rest of your tour. Best regards! Didi N.
We thoroughly enjoyed our time with Didi. He is a very knowledgeable and engaging guide. His knowledge, pride and passion for Salzburg was contagious. He went out of his way to help us, booked our dinner reservations too.... I would highly recommend him to my friends and family. Lovely personality and a great sense of humour. Thank you for your time Didi, we loved our time with you. We enjoyed our day with Didi from the moment we met him at our hotel! He personalized the tour for us to include seeing The St Nicolas church and Franz Gruber's home in Hallein which was very special to us! 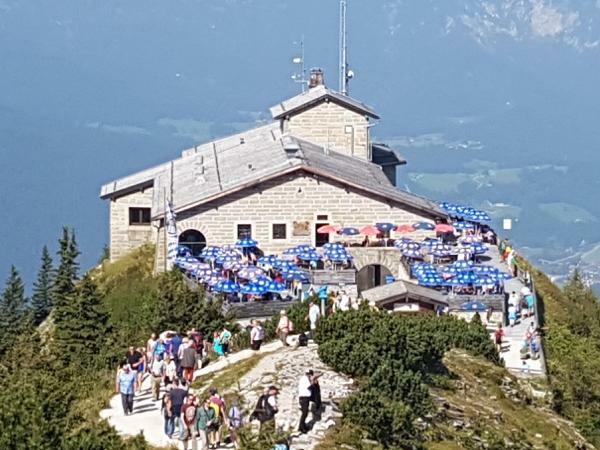 Seeing The Eagles Nest and the sight of where Hitlers home was and simply Didi's wealth of knowledge of Austrian and German history was fantastic!!! There was so much else included in our day such as the monastery in Biersgarten, Ice Caves, and many Sound of Music sites!!!!! Thank You!! A great day!!! I am writing on behalf of my client who is still traveling. Here is what he had to say: Deitner, the tour guide, was incredibly knowledgeable and very nice. However, he only had one speed and it was way too fast and way too much…we think he literally talked for 95% of the 4hrs we did the walking tour. It was impossible to get word in edgewise. He was nice and knew his history, but it was honestly painful…I would never use him again. TOUR GUIDE RESPONSE: Dear Rosi! I really can not believe that your client said this. First of all this was a 4 hours walking tour in downtown Salzburg that you have booked!!!! Salzburg is a World culture heritage with 42 churches,palaces,birthplace of Mozart,Doppler,Karajan and many others. City of the Sound of Music etc. They had done by themselves already the Mozartmuseum and wanted to do the Fortress too. As this I walked with them to places where they haven't been. As well as information for shops, bars and restaurant. This was our first time using Tours by Locals and Didi was fantastic. He was very professional and prompt. He took us to many sites that you are unable to visit on any cruise type excursion while going over the history of all the areas we visited or went past. We thoroughly loved our time visiting Austria and would definitely highly recommend this to anyone else. Our ToursByLocals guide, Didi, was FANTASTIC and we highly recommend the company and guides. We were able to cover so much more ground than our ship's scheduled excursion that the cost was well worth every dollar spent. Our guide got us into places that the gathered crowd did not see, got us to the front of the line, and had so much local information that we were the envy of our cruise when we returned to the ship. TOUR GUIDE RESPONSE: Dear Andrew! Thanks for rating. Enjoy the rest of your trip! Best regards! Didi N.
Absolutely the best tour guide we have ever had in Europe. Great stories,great history enjoyed this day immensely. We intend to recommend him to anyone going to Austria. Didi was great. Our how family thinks he was our best tour guide for our entire European adventure. He was able to give us an overview of Salzburg including the Sound of Music sites as well as an extensive tour of the Eagle's Nest and WW2 sites. His knowledge of history is staggering. He kept all 3 of our teens interest and helped us to fall in love with Salzburg. Dietmar was a wonderful guide. Very knowledgeable. The weather on the day of our tour was not great, but he still showed us all the sights of Salzburg from' the dry and comfort of his vehicle. We spent a great day with Didi driving on "The Lakes with Hallstatt" tour. Didi is a wealth of knowledge, and he took us to several very interesting stops in the area near Salzburg. The scenery was beautiful and amazing, and the background on the history and highlights from Didi made the trip very special for us. Hallstatt was the highlight, and the Beinhaus was very unique. It was a bit of a rainy day, and Didi made the most of the day none-the less. Thanks for a great day Didi! The walking tour of Salzburg with Didi was truly outstanding. His knowledge of the city and the history, and his pleasant personality, was a wonderful experience. Didi is one of the best guides we have ever met, and we would absolutely recommend this walk when you arrive in Salzburg to see the city. Our only regret was that we did not book any music concerts in the city in advance, which we only learned about from Didi on the tour. Overall many thanks to Didi for a memorable experience!!! My husband and I thoroughly enjoyed our delightful and informative day-long private tour of Berchtesgaden, Koenigsee and salt mines with Didi. He was knowledgeable, personable, and focused the tour very precisely on our specific interests, thereby providing insights and options that would not be possible with most tour experiences; for example, we took a fascinating tour of Hitler's bunker at Kehlstein that would be very difficult for larger groups. A great experience! "The Mayor of Salzburg!" Didi is great; he knows his history and the city of Salzburg - and he knows everyone in town. Our family of 3 had a great time with Didi during our tours. Didi is very punctual and extremely knowledgeable in all the places we visited. The tours were very interesting and enjoyable. He has a great van with wifi! He is a very nice man and we really had a wonderful time in all the places we visited on the way from Vienna to Salzburg, all around Salzburg, to Innsbruck and then back to Vienna. TOUR GUIDE RESPONSE: Dear Susie! Thank you very much for the comment. I wish you and your family a happy 2016! Didi assured we were comfortable and saw everything we asked to see. He brought our suitcases up to our room, waited while we used the toilet and then dropped us downtown so we could shop and have dinner. We were with him for about ten hours from Vienna to Salxburg. Well worthwhile. Do not miss St Michael's Basilica. Didi is charming, happy and very pleasant to be with. He adjusted each tour to our wishes which made our vacation perfect. He had wonderful suggestions. He knew what time to go so that we did not have to wait in long lines. He knew historical facts and the best restaurants. We will always be thankful for the time we spent with him. Didi is very knowledgeable about many topics and provided door to door service in his van. We enjoyed his company and appreciated his ability to take short cuts to avoid unnecessary traffic delays. TOUR GUIDE RESPONSE: Dear John! Thanks very much for the comment. All the best to you!!!! Merry Christmas and a Happy New Year!!! Didi was outstanding. He took us to all the filming spots in the movie The Sound Of Music. He even took us into Germany to show us where the filming was done for the opening sceen of the movie. Then he took us to a fabulous Austrian restaurant that was excellent. We then traveled and saw several lakes and towns and ended at the church where the wedding took place in the Sound Of Music. Didi knows his history!!! I recommend him highly!!! Fantastic guide and more than knowledgeable. Our guide, Dietmar (Didi), was absolutely wonderful. We would highly recommend him to anyone, especially those wanting to experience and really see what this beautiful region has to offer. We had a terrific and very full day with him. He was very accommodating of our special interests and gave us a thorough and interesting history and overview of everything we saw. We loved every minute. He is a delight. We will be certain to tour again with Didi next time we are in this area. Didi was fantastic and so knowledgeable of Salzburg, the Sound of Music (movie and true story), and miscellaneous world history to tie it all together. He was entertaining, helpful, and courteous at all times. He even gave us travel advice for our next day's journey. Fantastic guide. THANK YOU! Didi is a wonderful guide. His knowledge of the history and the local folklore was spectacular. He kept us entertained all day. One of the highlights was that Didi could take us up into the hills where the Sound of Music was filmed. the view was spectacular and not something we would have had in a big group tour. You couldn't have a better guide that Didi. His knowledge and fun loving nature made the day go by fast. We loved it! Didi is simply the best! We work in the hotel industry in the U.S and really appreciated Didi's knowledge and passion for Salzburg. His expert knowledge of the history of Salzburg really added to our experience. In addition he took us to locations in the "Sound of Music" that were not available on the regular bus tours. Thank you Didi for making our stay in Salzburg so memorable. We will certainly recommend you to our friends. TOUR GUIDE RESPONSE: Dear Adrian! Thanks very much for the comment. I will meet you in Las Vegas on my trip to the US. Best regards to you all!! TOUR GUIDE RESPONSE: Thanks for the comment! Best regards from Salzburg! Dietmar was full of energy, entertaining stories, and insider tips! We had a lot of fun and the city really came alive with all the stories and history! Highly recommended! TOUR GUIDE RESPONSE: Dear Zhuozi Ye! Thanks for rating. Best regards to both families! Didi N.
Didi was a wonderful guide. He was able to speak to us in Spanish and in English when needed. His knowledge of history was impressive and he took us to many of the most interesting places in Salzburg in just a half-day tour. I would recommend his tour to anyone. Didi was a good guide for us. He knew the history along with the places we needed and wanted to see. TOUR GUIDE RESPONSE: Thanks for the ratings and best regards from Salzburg!!! Didi is a great guide. He is not one of those who has a prepared script, and instead takes you around in a friendly and relaxed manner (like being with a friend). So you'll enjoy while seeing the sights. We will try to visit other places in Austria and Germany with him again. TOUR GUIDE RESPONSE: Dear Joselito! Thanks very much for the comments and looking forward to hearing from you again. Best regards Didi N.
Dietmar was great. Showed up as promised on Easter Sunday, was flexible with having two young children along on the tour and gave us a good and informed overview of the city of Salzburg. Would definitely recommend to others. Didi's tour was fantastic. We were amazed at his extensive knowledge and how passionate he was about his subjects. Didi literally talked from start to finish. We also appreciated that Didi was able to structure the tour to suit the poor weather conditions experienced on our tour. We all very much enjoyed the unscheduled stop at the Red Bull Museum when the weather was at its worst. The kids also enjoyed the Sound of Music aspect of the tour and visiting the various locations which featured in the movie. TOUR GUIDE RESPONSE: Dear Amal! Thanks very much for the ratings. I wish you good luck for your excelent project in Oman. Please do not hesitate to contact me, if you need any information and contacts here in Salzburg. Best regards! Didi N.
TOUR GUIDE RESPONSE: Dear Jean and Jim! Thanks a lot for the nice comments. I wish you a Merry Christmas and a Happy New Year! Please feel free to contact me any time!!! Best regards! Didi N.
TOUR GUIDE RESPONSE: Oh Jean! Thanks very much for the nice comments. I tried to send you the mail, but it always returned. Check the website please of Dr. Drekonja on orthemedplus. All the best! I hope to see you soon again!! Best regards Didi N.
Didi is a great guide - 5 star PLUS. Knowledgeable, entertaining and most flexible in accommodating his customers. Didi, we had a great time! THANK YOU! TOUR GUIDE RESPONSE: Hi Dennis! Thanks very much for this nice comment. Now let's hope that I get something done for Andre and his big talent in Music! All the best for you too! Best regards! Didi! Didi is a unique individual. He was knowledgeable of the areas we visited, Salzburg and Berchtesgarden. The dates and facts of history of these areas that he was able to bestow upon us was incredible. While on the road between sights he entertained us with his jokes and songs. A good guy and an even better guide. DiDi is most knowledgeable and shared more facts about the places we visited than a history professor. If he did not have the answer to a question he immediately looked it up. We appreciated his experience and ability to share his information with our grandson as well as the adults in our group. TOUR GUIDE RESPONSE: Dear Hb!Thanks very much for the comment. I wish you all the best and hope to see you again im Salzburg! Best regards, Didi N.
Because I wanted to customize my tour, I chose Didi from the guides available on the website page for Salzburg, Austria. I couldn't have done better. Didi is everything and more that you would want from a guide. He was prompt, courteous, proactive, organized, a font of knowledge which he shared in a charming way, able to develop a keen sense of the people he was with, and on and on. If you want a genuine person who will fulfill your dreams and wishes, choose Didi. I'd give him ten stars if I could! TOUR GUIDE RESPONSE: Hi Grzegorz! Thanks for the comment! Didi was perfect! The tour was amazing! He knows his stuff....he gave us a lot of info. He had us all interested from morning until night. I would definitely recommend Didi and a tour of Salzburg. Susan Forrest from Vancouver Island Canada. Didi is a wonderful guide! My family and I truly enjoyed our tour of Salzburg and the "Sound of Music" sights in the city and countryside. We learned so much from him -- he is extremely knowledgeable about local history, music and culture. The day was very well planned, allowing us to see so many sights and varied locations we could never have found on our own. He helped to make our visit to Salzburg very special -- this tour was one of the great highlights of our trip this summer. I had an unforgettable tour of Salzburg! Didi's knowledge of the city's history, its people and its culture made the visit even more exciting. Of course we went to all the sites related to the "Sound of Music" but as we walked through he explained all the other landmarks. He also drove his minibus and we went to the hills of Salzburg as well as the lake towns outside of the city. He is nice and friendly and as he found out my interests he taylored the tour accordingly. Awesome tour and guide. Thanks!! !